Few series divide players – including our own writers – as sharply as Dragon's Lair. Originally intended for the LaserDisc format, its titles are more interactive movies than traditional video games, tasking you with pressing the correct button quickly enough every few seconds. If our hero, Dirk, has to run to the left, you press the left button, and the doorway to Dirk's left would blink to prompt you. Memorisation is a big part of the experience and until you've got it down, you can expect to see the same animations repeatedly. Some will enjoy this for the skill involved and for the film itself, like our own reviewer did when tackling the original Dragon's Lair, while others will go insane from the redundancy, like a different writer nearly did while evaluating its spiritual successor, Space Ace. 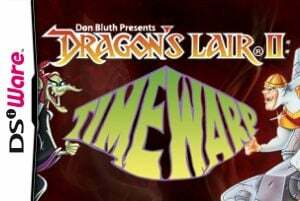 Now comes the proper sequel, Dragon's Lair II: Time Warp, offering a very similar experience that will again surely divide its audience. 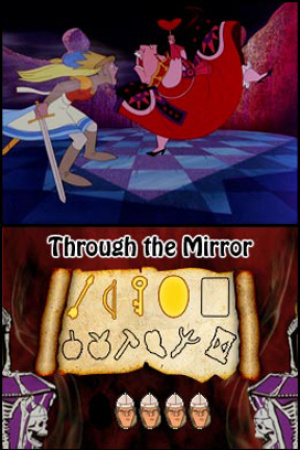 Unlike the original, Time Warp takes a cue from Space Ace in that you linearly progress through events. These see the daring Dirk questing to save the kidnapped Daphne, an adventure that includes stops in the Garden of Eden, Beethoven's studio and even Wonderland, where you'll ride a floating Cheshire Cat head as it recites verses of the Jabberwocky. All of this is beautifully animated under the direction of Don Bluth, the headstrong upstart who left Walt Disney Studios to create such beloved films as An American Tail, All Dogs Go to Heaven, The Land Before Time and The Secret of NIMH. The writing isn't as impressive as any of these, however, the game relying instead on near-constant action and fight sequences. The biggest problem with this release is the format. It still looks decent, but the compression that it suffers from running on the DSi screen instead of a television set or arcade cabinet damages Time Warp's greatest asset – its looks. The animation is still fluid but nothing is as distinct or vivid as it was meant to appear. Worse still, it makes some visual hints quite hard to catch, and certain segments can become very tricky as a result. 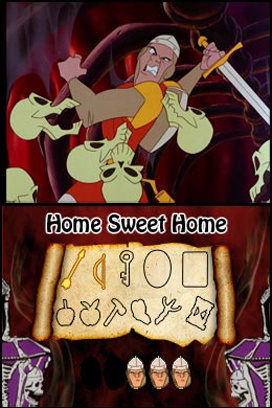 Dragon's Lair II presents you with two modes, Original and Director's Cut, the latter of which simply changes the ending scene and nothing more. You're allowed to raise your life count to infinite, an indispensible help, but oddly this sequel does not include multiple difficulty levels. When Digital Leisure ported the original to DSiWare, it allowed you to choose between Easy and Hard and thus increase the window in which you're allowed to react, but this option is confusingly absent here. Visual cues, hard as some are to see on the small screen, come at you rapidly and without respite. It's always nice to have a break to rest or a change of pace, but you won't get either in Time Warp. Instead it will keep you firmly on your toes, which means that the level of challenge is high. At the same time, though, it forces you to go back to the beginning of the scene when you fail, which you will, and possibly repeatedly, watching the same sequences over and over until you get the commands right. Additionally, it would have been welcomed to be able to watch this all the way through without stopping to press the correct button, but that's not an option here either. One minor addition in this sequel is that of golden collectibles that appear along the way. This is a quite superficial change, however, not adding much depth to the experience. Those who dislike the series will see it as just another timed button-press, while fans will enjoy having a little something extra to challenge them. Not Dragon's Lair II, nor any of Don Bluth's games, were meant to run on the DSi. The visuals, their greatest asset, don't look as crisp as they should, and graphic cues are often difficult to distinguish. Beyond this, it utilises a style that will look to some like a challenging trip through a classic cartoon and, to others, like a maddeningly repetitious gauntlet of 20-year-old non-gameplay not dissimilar to an interactive DVD extra. One thing's for certain, though – DSiWare is not the knight's most appropriate suit of armour. At least the trilogy looks better on the wii. I have this on dsiware, the original, and Space Ace. The game looks good for a dsiware release. You can't expect it to look exactly like the arcade version, considering the memory they had to work with. Also, the audio for Dragon's Lair 2 is higher quality than the other two. The plus for fans of all three Don Bluth's games is having them available in arcade form on a portable via Dsi. Thank you Digital Leisure! I have the trilogy on Wii as well! I downloaded this on Monday. I actually think its a very good port for a portable system. However Dragon's Lair II never WOWed me like the original did. Running from Dirk's Mother-In-Law and time travelling was never as fun as escaping the devious trap rooms of Singe's Castle. In the Trilogy version, gathering the items is (to my knowledge) crucial to enabling the final scene. Is that true for this version? Also, will Trilogy be getting a review? Yes, it's the same for this version. Hey Zach, you mention that "when we ported the original to DSiWare, it allowed you to choose between Easy and Hard and thus increase the window in which you're allowed to react, but this option is confusingly absent here." We always attempt to create an authentic arcade experience. As the original DL2 arcade game did not have an Easy/Hard option the DSiWare doesn't either. Thanks for the review. I've long been a fan of the Dragon's Lair games, but I haven't played this sequel in years. And sure we'll be happy to take a look at the trilogy. I do remember I didn't care for this sequel as much as the original. Perhaps a lot of that has to do with the nostalgia factor. DUDE!! IVE BEEN WAITING FOREVER FOR THE SEQUEL!!! But I was hoping there was going to be a sequel but I AM A LUCKY MAN!!! I love Zach's reviews, but lately he only gets to review crap games. And to clarify, a 5 isn't crap, it's just average. No Rocky Horror pun in the Tagline? For some reason I was expecting to read " Lets do the Time Warp again!" HP3- Dude that had 20 mb to work with. Do you know how much that is? Did you know that Super Mario 64 is only 7 mb? I'll pass on this as I bought the original Dragon's Lair, and once I'd finished it, I never played it again. Even when I was playing for the first time, I was bored by the gameplay. Don't fret it - these games are terrible on any platform. The iPhone has a great port of Dragons Lair, but the game is incredibly awful. It's barely even a game. Yes, I knew that. Digital Leisure ports are still good on dsiware. @Crunc: Its not really supposed to be a game though. If you went ito it expecting it to be a triditional game then obviously your going to be disappointed. I was really interested in this since Don Bluth is one of my favorite animatores. But I don't think I'll even bother with the DSi versions... plus I don't even have a DSi. When's this being released in Europe? They're not just going to leave us with just the original game and Space Ace are they? 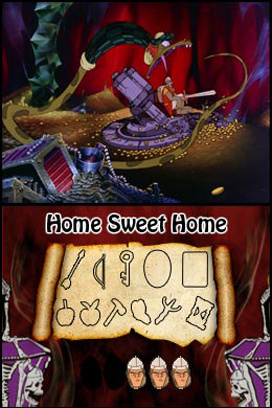 I'm a completionist, I need it to complete my DSiWare Don Bluth trilogy.